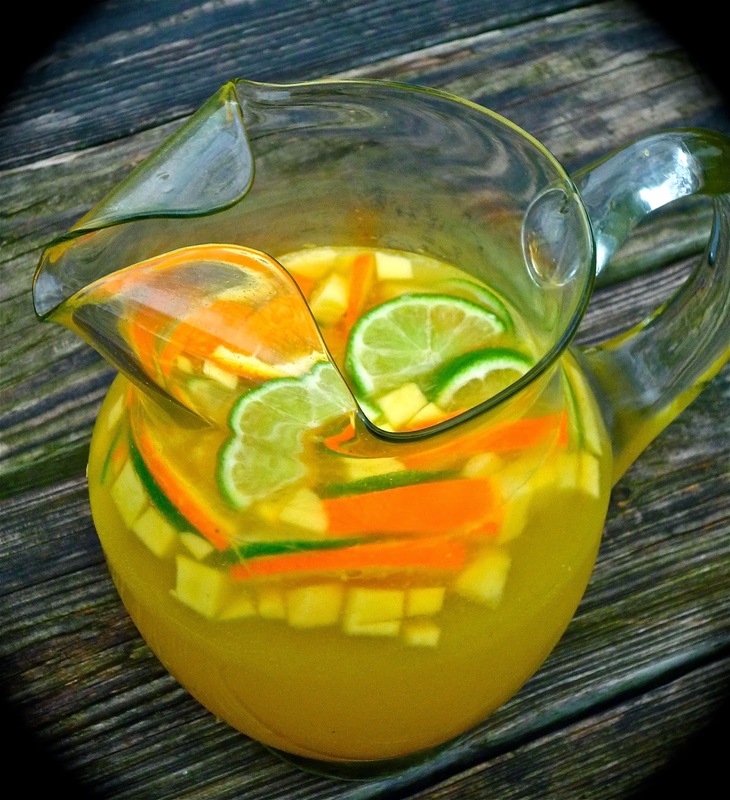 During our Cancun vacations, we enjoyed lots of fresh tropical fruits…including pineapple and mango…so I made sure to include both of them in my sangria. 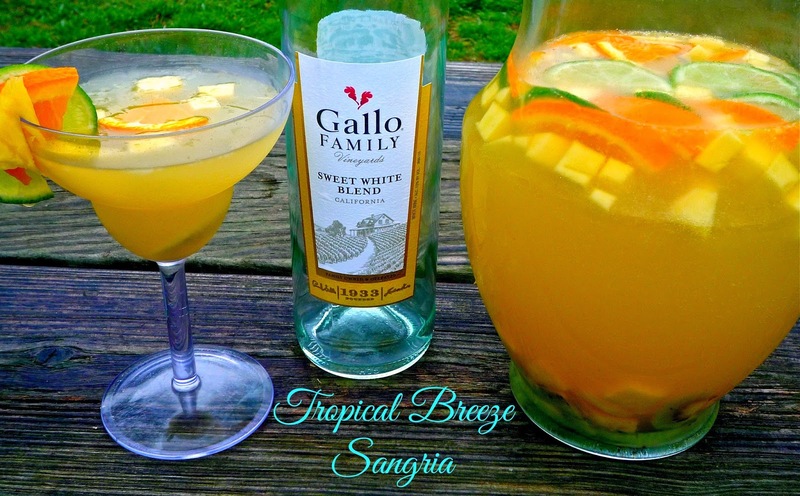 The Gallo Sweet White Blend wine was the perfect base for this refreshing sangria. During one of our trips, we bought fresh coconuts from a vendor on the side of the road and drank the sweet coconut milk inside. Inspired by this experience, I added some flavorful coconut water too. One sip of this fizzy island-inspired sangria, and you’ll be immediately transported to a tropical beach paradise – even if it’s still cold and snowy in your backyard right now! Come…let me whisk you away to the tropics…even if it’s only in your mind! **NOTE: If you can’t find prepared lemon simple syrup, it’s easy to make. Add ½ cup water, ½ sugar, and the juice and zest of 1 lemon to a small saucepan. Stir to dissolve and bring to boil. Let cool and use. Step 1: Add the fruit to the bottom of a large pitcher. Add the simple syrup and give it a good stir. At this point, you can refrigerate the pitcher until you’re ready to serve. I like to do this part the afternoon, a few hours before I plan to serve the sangria…to let the fruit flavors mingle and combine. Step 2: Add the Gallo Sweet White Blend wine, coconut water, juice, and lemon-lime soda to the fruit and simple syrup in the pitcher. Stir to combine and pour into glasses. Garnish with a slices of pineapple and/or citrus. I particularly like to pair this sangria with a big bowl of guacamole and warm salted tortilla chips to really take me back to the beaches of Cancun! Wow…this sangria is like a tropical vacation in a glass! The Gallo Sweet White Blend provided a perfect sweet base note that sets the tone of the sangria. The coconut and pineapple give it a bit of a pina colada flavor profile, and the lemon lime soda provides a refreshing fizz! It may only be March, but it may as well be July in Cancun as I sip a glass of this sangria. I especially loved the bits of juicy tropical fruit in my glass. I may not be psychic, but I predict that this sangria will be a big part of my celebrations this Summer. It will be so refreshing on a hot Texas Summer evening! To find Gallo wine near you, be sure to visit the handy Store Locator on their website. Also…be sure to follow Gallo Family Vineyards’ social media channels so you can stay up-to-date with all of their latest news! I hope you’ll join us this evening at 700 EST/600CST for our weekly #SundaySupper Twitter chat! We’ll be talking about food and wine…and recipes that tell a story…so be sure to come join the fun! In the meantime, I hope you’ll click the links below to check out the other fabulous recipes featuring Gallo Merlot and Sweet White Blend that my #SundaySupper friends are sharing. They all sound absolutely fantastic! Disclosure: This is a compensated post for #SundaySupper featuring Gallo Family Vineyards wine. All opinions expressed are my own.